If you’re in the market for a sleek luxury sedan with some serious oomph, consider the Genesis Motor America G70. “Genesis?” you may ask, having not heard much about this relatively new car manufacturer. Around since its conception in 2008, Genesis is the luxury automotive arm of Hyundai, which took until 2016 to launch its first vehicle in the U.S. It took them a couple of years, but now there’s little doubt that Genesis has a real winner on its hands. 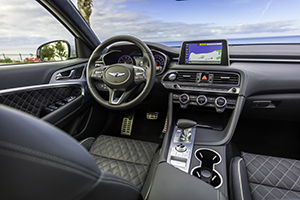 Their 2019 G70, the third Genesis released into the American market, is piling up an impressive list of awards, starting with Car and Driver magazine naming it one of their 10 Best and also garnering 2019 MotorTrend Car of the Year on the sedan. Add in Cars.com calling it their Best of 2019, and MotorWeek annointing it their Driver’s Choice Best Luxury Car and this Genesis vehicle is really riding high. The G70 also took home the industry’s top award, chosen as the 2019 North American Car of the Year, leaving little doubt that this four-door sedan has something incredibly special about it. Its qualities are obvious at first glance, with a sleek, low-slung profile, a massive front grille with catlike eyes (LED headlights that illuminate in both day and night), and a cockpit that evokes a much pricier level of luxury. For the G70 has a base price of $34,900 (for the 2.0T advanced RWD model), with a top price for the 3.3T dynamic edition priced at $52,250. Those lower stickers are part of what make this Genesis model so appealing, for every aspect of this car—from exterior style to the responsive turbo-charged 4-cylinder engine with multiple driving modes to the well-designed interior—give off the feel of a car worth twice that price. Those driving modes include Comfort, Smart, Eco, Custom or Sport, allowing you to make the G70 into exactly the kind of vehicle you feel like driving at the moment. We loved the Sport mode, which made it roar like a jungle beast and leap ahead, while still maintaining complete road control. The Comfort mode is perfect for city driving, more relaxed and easygoing than Sport, but still very responsive and ready to move quickly when asked. The Eco mode saves a bit of gasoline, which is one of the G70’s only drawbacks, getting a paltry 22 mph city and 30 mph on the highway. But luxury automobile lovers know that it isn’t easy to get top-notch mileage unless choosing a hybrid or an all-electric car; doing that means losing the performance aspect that makes the G70 such a delight to handle. Driving the G70 is half the fun; just being inside the car is the other half, despite the fact that the vehicle is considered a compact sedan. With soft leather front seats that adjust 16 ways to allow you to find your ideal comfort setting, you can also choose seats that are heated and air conditioned, ready to help you face the worst weather conditions. There’s a state-of-the-art media and navigation system (naturally) and an added treat, the Surround View Monitor, a camera that not only looks backward in reverse but also scans 360 degrees around the car. That means no more worrying about things to scrape or hit beside or in front of the car. And you definitely don’t want to ding your G70, for its exterior is really a thing of beauty, especially in the Cobalt blue or bright Havana red versions. It also comes in black, white, grey, silver and dark blue, for those of you who like to keep a lower profile on the road. We’re partial to the racy red, for this is a car that cries out for attention, no matter where you roam. For more information on the GenesisG70, visit genesis.com.